This elaborate, asymmetrical, limestone pile is one of the most distinctive churches in the city and its congregation has long been one of the city's most prestigious. The building, shown at the right, is interesting mostly for its inventive eccentricity and for its huge and awesome reredos behind its altar that was designed by architect Benjamin G. Goodhue and sculptor Lee Lawrie. 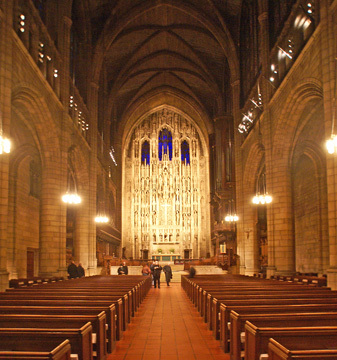 While original in its design of an off-center nave and a single, asymmetrical major tower, the building is ruggedly masculine and handsome rather than gracefully beautiful. Most critics have praised it for its good adaptation to its corner site. Its site extends quite far down 53rd Street where it abuts the Museum of Modern Art (see The City Review article) and its street wall of small arcades and occasional gargoyles is quite intimate and charming. Like its Presbyterian church neighbor two blocks to the north on the same side of Fifth Avenue, St. Thomas has a fairly steep entrance staircase that when crowded after services is very grand. The church's first home was built in 1826 on Broadway on Houston Street and burned in 1851. Its replacement on the same site was given up by the church because its neighborhood had changed in 1870 when it moved to this site. Its third building, designed by Richard Upjohn, burned in 1905 and was replaced by this structure. Goodhue also designed St. Bartholomew's Episcopal Church on the west side of Park Avenue between 50th and 51st Streets, the Park Avenue Christian Church (Disciples of Christ) that was formed the South Reformed Church at 1010 Park Avenue at 85th Street, the St. Vincent Ferrer Roman Catholic Church on the southeast corner of Lexington Avenue and 66th Street and the Episcopal Chapel of the Intercession on Broadway at 155th Street. Goodhue's firm won an architectural competition for the new St. Thomas Church. One of the losing entries by George B. 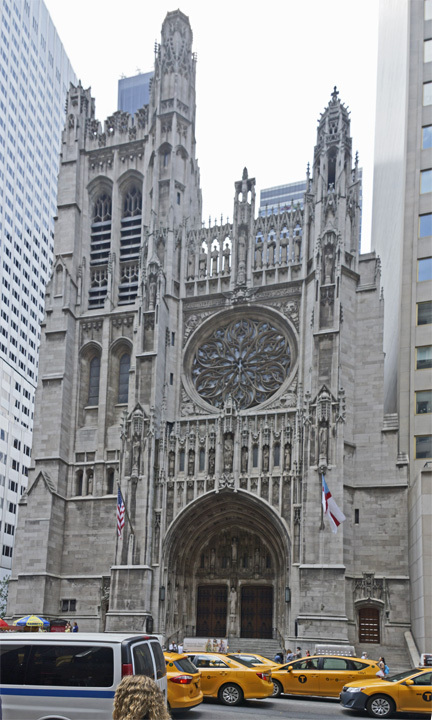 Post was modeled closely after Notre Dame in Paris and another, by Robert W. Gibson, the architect of the Cartier Building (see The City Review article) on Fifth Avenue, was a triple-bay Gothic confection vaguely reminiscent of the dramatic cathedral in Milan. This church has an excellent website with many details and illustrations about the church.